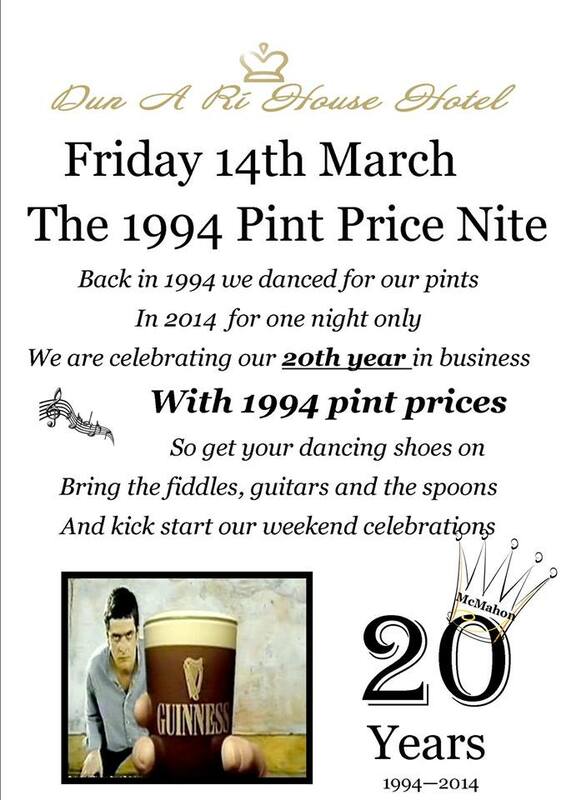 Fri March 14th – 1994 Prices night! Categories: Special Offers	| Comments Off on Fri March 14th – 1994 Prices night! Are you following our Facebook page at www.facebook.com/dunarihouse ?? 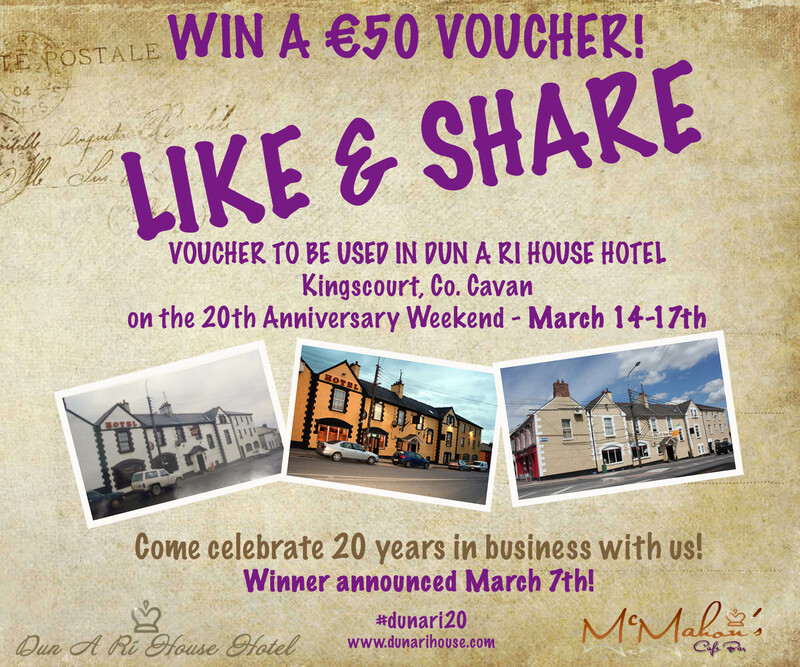 There is a chance to win a €50 voucher to be used in Dun a Ri House Hotel Kingscourt, Co. Cavan on the weekend of our 20th Anniversary. Like & Share the image and be in with a chance to win. Winner will be announced on Friday March 7th. 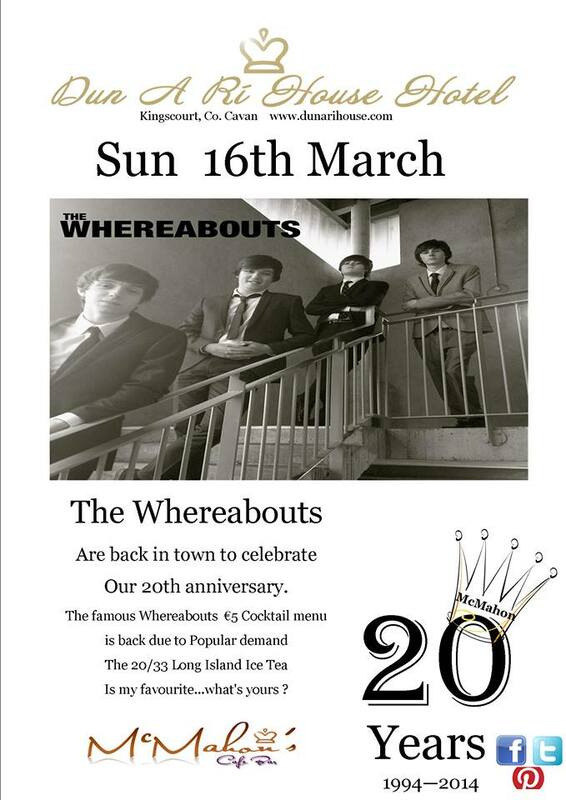 The McMahon Family will be celebrating 20 years in business in Dun a Ri House Hotel the weekend of March 14th-17th. We opened our doors to the public on March 15th, 1994. 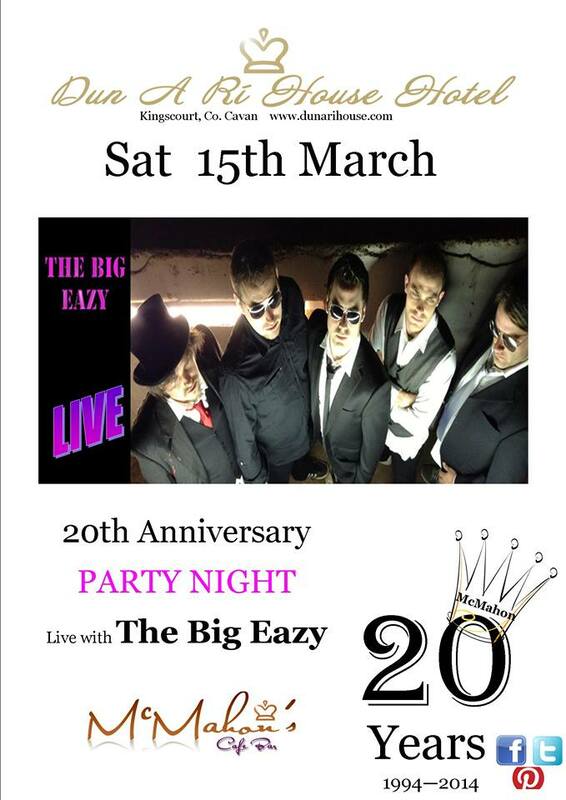 See posters below for the entertainment on Friday March 14th (The 1994 Pint Price night), Saturday March 15th (The Big Eazy), Sunday March 16th (The Whereabouts) and Monday March 17th (The Kingscourt St. Patrick’s Day parade). Follow the daily updates on Facebook (/dunarihouse) and Twitter (@dunari) and Instagram (@dunari) – Use Hashtag #dunari20 for the Anniversary weekend. The McMahon Family would like to thank everyone who crossed over the threshold over the last 20 years. There were so many chats, laughs, tears, singsongs, lost jackets, bags & phones …but mostly some Great memories! Thank you! Oh to be in Dun-a-Ri for your Christmas Party. €29.95 per person – call us at 042-9668091 to book. Looking for something to do in Kingscourt Co. Cavan on the October Bank Holiday weekend? 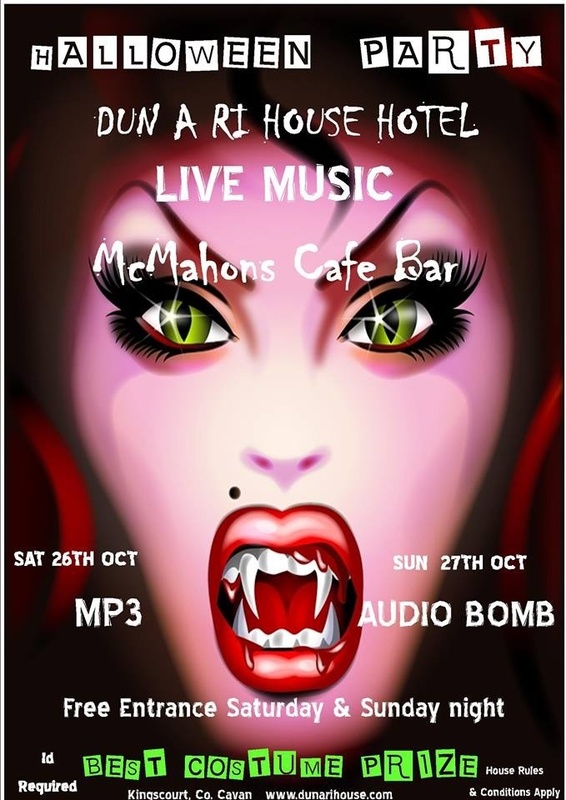 Dress up in your best Halloween costume and head down to McMahon’s Cafe Bar and Ozone Nightclub on Sat October 26th and Sunday October 27th. Free entrance to Ozone on both nights. Prizes for best Halloween costume. 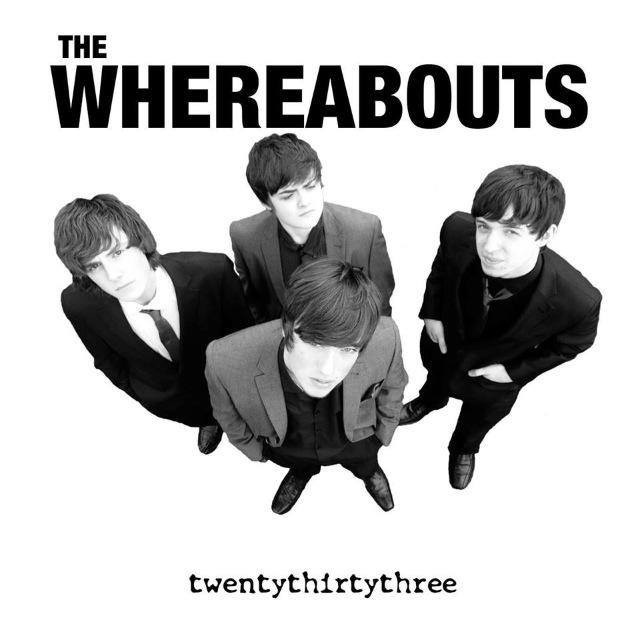 The Whereabouts are a Kingscourt based Blues/Rock Band. Playing music in the style of The Beatles, to Bo Diddley. They have just recorded their first six track EP and Music Video. If you go in to twentythirtythree on you tube. You can see them perform one of their songs. Their launch night is on Sat 28 Sept here in McMahon’s Cafe Bar .Everyone is welcome. No cover charge. 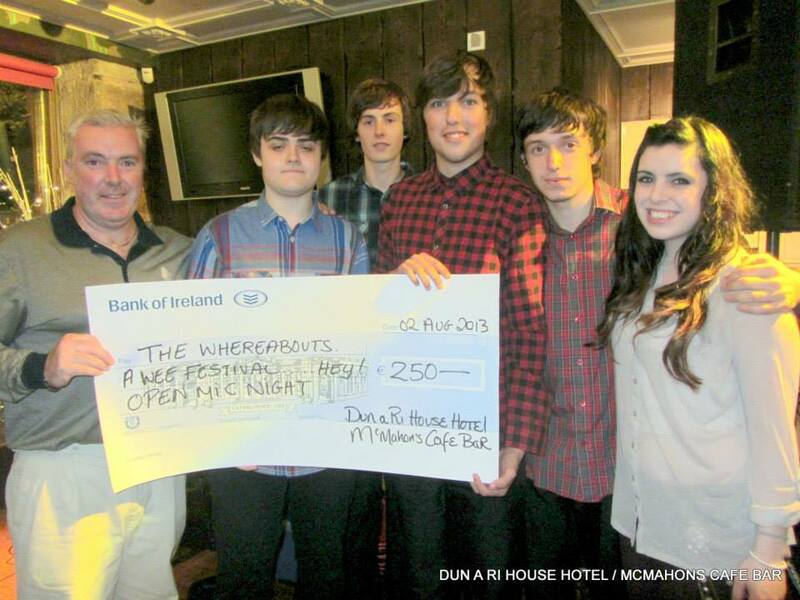 It was here at McMahon’s Cafe Bar in Kingscourt Co. Cavan that ‘The Whereabouts’ won a recent Open Mic Competition. We wish them the very best of luck with their EP Launch on Sept 28th! The University of Central Florida (UCF) and Penn State will play their season opening game of the college football season in Croke Park, Dublin August 30th 2014 (known as the Croke Park Classic 2014). Thousands of American Football fans are expected to travel to Ireland for the game. It will be the first time that the teams have played outside the United States. It will kick off at 1:30pm in Dublin and will be televised by ESPN2. Dun a Ri House Hotel will be offering package deals for those traveling independently to Ireland for the game (which will be bookable online in September 2013). In the meantime you can call us directly at +353-42-9668091 to express interest in any accommodation in advance of online sales. Kingscourt is about 95KM from Dublin City Centre and the closest International Airport would be Dublin Airport which is 86KM away. It is easy accesible from the M1 Motorway and takes just over 1 hour via road. The closest train station would be in Dundalk, Co. louth and that is 40KM away. Train timetables can be access from the Irish Rail website. Kingscourt (Irish: Dun A Rí) is a busy market town in County Cavan. The town was founded near the site of the old village of Cabra, by Mervyn Pratt esq., towards the end of the 18th century. Cabra Castle, a fine example of a Normandy Style Castle is located near the town. Dun A Ri Forest Park located just a mile from the town is a tranquil glen containing a wishing well which is featured in the song “Doonaree”. The Park is maintined for public recreation and amenity. The Catholic Church in the town contains some excellent stained glass windows by the renowned Irish Artis Evie Hone. The surrounding countryside provides excellent fishing in many of the numerous lakes. 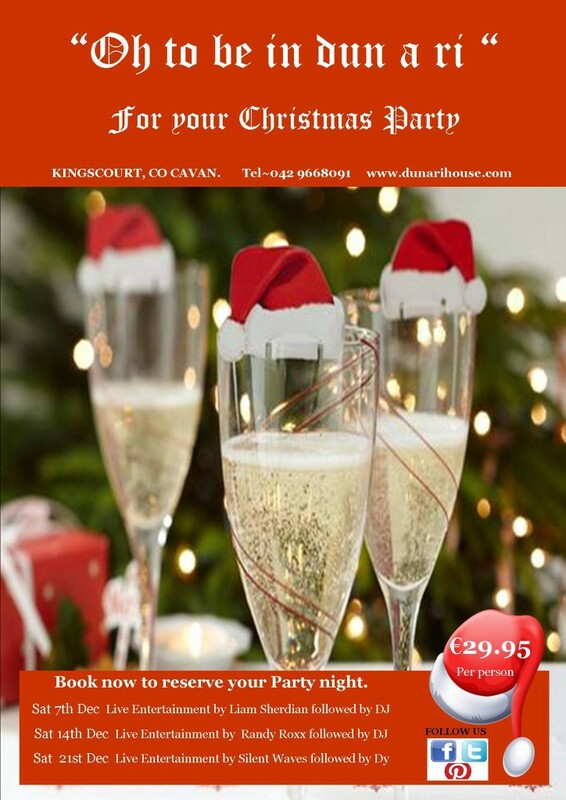 Kingscourt is a leading Industrial and Commercial centre with many professional consultants choosing to stay at the Dun A Rí House hotel during their visit to the area. Dun a Ri Forest Park & Kingscourt Co. Cavan as shown on UTV’s Lesser Spotted Ulster in December 2012. About 5 mins into Part 1, you will spot McMahon’s Cafe Bar and Dun a Ri House Hotel.